This poster explores symbolic neuronal operations of the vertebrate brain. Our readily-introspected Daily Memory Records document a symbol-rich, experience-dependent capability for organizing time, space, objects, actions, thoughts and feelings. These DMRs have implications for animal & human intelligence, sleep, and the emergence of language. Work in progress is intended to integrate our under-standing of local neuronal operations with computational models so as to produce a more synthetic understanding of the workings of the human brain and mind. This work will feature technology-rich advances being made on neocortical and other telencephalic / diencephalic circuits. These advances provide necessary constraints and content with which to formulate an evolution-guided perspective. ABOVE: Coupled Oscillators can have bistable states: OFF and ON. 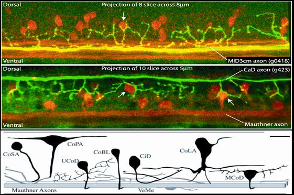 This may provide a means of instantly activating links between diverse neuronal symbols in the vertebrate forebrain--while also controlling locomotor behaviors of the larval zebrafish. See Knudsen et al. 2006. 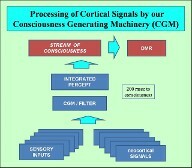 LEFT: schematic of how the CGM streams organized sets of symbols (integrated percepts) into Consciousness, from which a subset are written into our Daily Memory Records by a flash mechanism, possibly involving silent synapses or coupled oscillators (Gioioso & O'Malley, 2009, SFN abstract/poster).